19 March 2014: So far there has been no credible sign of missing flight MH370 in Maldives, said the Chief of Defence Force. He said there was a report that a low flying aircraft was spotted by some of residents in Kudahuvadhoo island, preliminary results show the claim not valid, said the chief. He said the case is being investigated further and he could not conclude otherwise at this time. When questioned, the chief said it was not clear why they claim to have sighted a low flying aircraft which fits the description of missing Malaysian Airlines flight. Such a flight path would need more than about 9 hours from fuel. 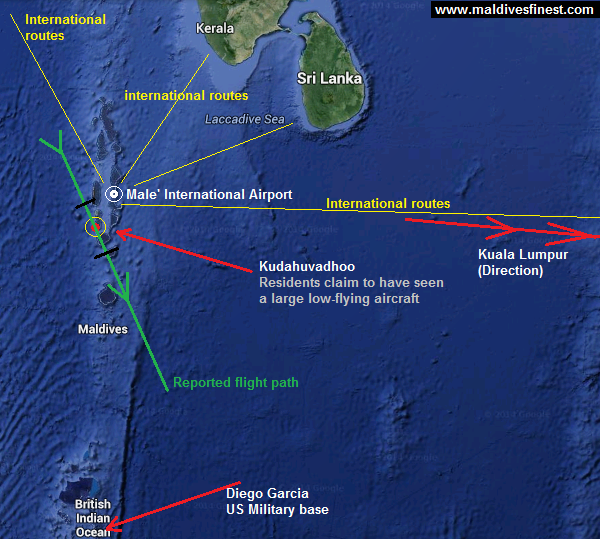 Based on the findings by Malaysian Authorities and investigators of United States, it is highly unlikely that the plane claimed to have sighted in Maldives was missing MH370.